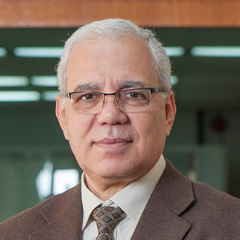 Mr. Ali joined CIPR on July 3, 1987 as an associate director and researcher. His spectrum of experience is essentially focused on Reservoir Characterization, Petrophysics, Rock Physics and Geostatistics together with his administrative assignments. Geology, petrophysics, geomechanics and geostatistics. Guodong Jin, Héctor González Pérez, Gaurav Agrawal, Mohamed R. Khodja, Abdulwahab Zaki Ali, Syed Rizwanullah Hussaini, and Zaid, Zaffar Jangda (2015) “The Impact of Gas Adsorption and Composition on Unconventional Shale Permeability Measurement”, SPE 172744. Guodong Jin, Héctor González Pérez, and Gaurav Agrawal, Abdulwahab Zaki Ali, and Mohamed R. (2014) “Elastic Anisotropy of Unconventional Shale at Reservoir Conditions – New, Faster Laboratory Characterization Technique”, SPE 170839. Guodong Jin, Héctor González Pérez, Gaurav Agrawal, Mohamed R. Khodja, and Abdulwahab Zaki Ali (2015) “Permeability Measurement of Organic-Rich Shale – Comparison of Various Unsteady-State Methods”, DOI: 10.2118/175105-MS.
Ayadiuno C.B., Abdulwahab Ali, A. Bakhorji, S.S. Ali, S. Nizamuddin, A. Abdulraheem and H. Eltom (2015) “The Effects of Saturation and Pore Structure on Acoustic Properties of Carbonate Rocks”, EAGE Madrid. Sahin, , A.Z. Ali, S. Saner, and H. Menouar, ” Permeability Anisotropy Distributions in an Upper Jurassic Carbonate Reservoir“, Saudi Arabia, Journal of Petroleum Geology, Vol. 30, No. 2, pp.147-158, January 2007. Sahin A., Ghori S., Ali A., El-Sahn H., Hassan H. and Al-Sanounah. (1998), ” Geological control of Variograms in Complex Carbonate Reservoir“, Eastern Province, Saudi Arabia, Journal of Mathematical Geology, Vol. 30, No. 3. Sahin, A, Menouar, H, Ali, A and Saner, S. (2003), ” Patterns of Variation of Permeability Anisotropy in Carbonate Reservoir, SPE“, Middle East Oil Show and Conference, Bahrain June, 2003, SPE 81472. Shehata W., Bader T., Irtem O., Ali A., Abdullah M. and Aftab S. (1992), ” Rate and Mode of Barchan Dune Advance in the Central Part of Jafurah Sand Sea“, Journal of Arid Environments, 23: 1-17. Ali, A.W.Z. and Al-Hinai, K.G (2003), “Interactive Expert System for Selecting Sand Control Measures Based on Geomorphic Terrain Properties, Proceedings of Sand Encroachment Phenomena on Railroad and methods of remediation”, KSA. Al-Hinai, K.G and Ali, A.W.Z. (2003),”Sand Encroachment Problems: Strategies and Remediation, Proceedings of Sand Encroachment Phenomena on Railroad and methods of remediation“, KSA. Prince Mohammed Bin Fahd Bin Abdulaziz Al-Saud Prize for Scientific Excellence in 1996 for being a team member for Sand Stabilization Project at Shaibah Field, Eastern Region, KSA.